Chairman Award winning property. The Days Inn Tukwila welcomes you. 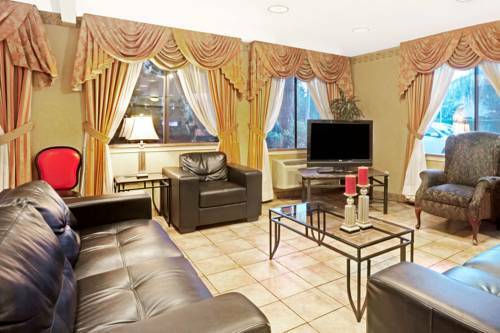 Conveniently located off I-5 close to SeaTac Airport, downtown Seattle and major shopping areas. The Days Inn Tukwila is the ideal location to accommodate all of your travel plans. Shuttle service available during the following hours, Monday - Friday 5am-11pm, Sat and Sunday 7am-11pm please call hotel for details. We offer free local calls, free high speed wireless internet, complimentary continental breakfast, a seasonal outdoor pool and hot tub, cable channels including HBO and a variety of room types to fit your needs. All our rooms are clean, comfortable and include a microwave, refrigerator, hair dryer, iron and coffee maker. The Days Inn Tukwila is a clean, convenient location with a friendly 24 hour onsite staff and great amenities. Within walking distance to restaurants, Starbucks and area bus lines. Property does not accept pets. Park Before You Fly Packages Enter SR2 in Promotion Code for rates and availability... Package includes: 7 days free parking with one nights stay/ Shuttle service to and from the airport. Additional charges apply to parking exceeding 7 days. Enter SR2 in Promotion Code for Park Before You Fly Package Please call hotel for additional information We look forward to welcoming you as our guest at The Days Inn Tukwila.